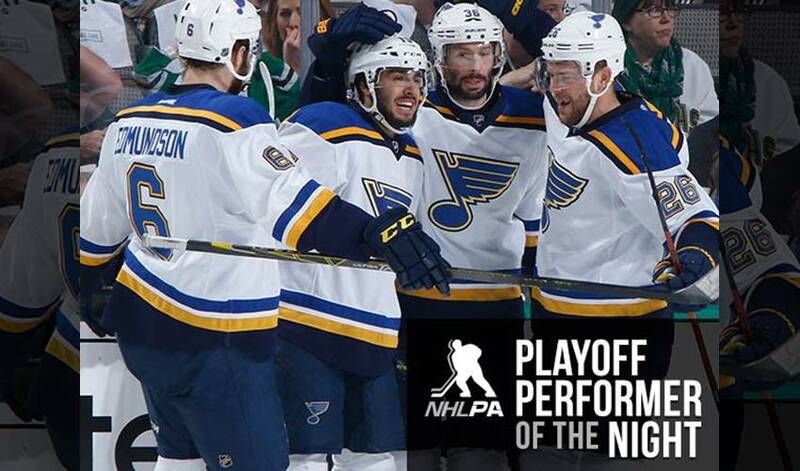 Robby Fabbri skates away with PPOTN honours after his three-point performance in St. Louis’ 6-1 win in Game 7 against Dallas. The centreman contributed one goal and two assists in the victory that sent the Blues onto the Western Conference Final. STAT PACK: Fabbri had two shots on goal, was a plus-1, recorded one hit, and took 19 shifts for 12:01 of ice time. THREE CHEERS FOR THIS THREE: The line of Fabbri (2-6-8), Brouwer (4-4-8) and Stastny (3-4-7) totaled 9-14-23 in the Blues’ seven-game victory over the Stars. BRING IT ON: “The way we feel here, we know we've got a good team and we know every time we're challenged we've kind of risen up to it," said Paul Stastny. YOUNG GUN: At 20 years, 110 days, Fabbri became the youngest player in Stanley Cup Playoffs history register three points in a Game 7. He also became the youngest player in Blues history to score in a Game 7. BROTHER ACT: Fabbri lists his older brother, Lenny, as the most influential person in his hockey career -- Lenny played for the University of Guelph in 2013-14. TROPHY TIME: Fabbri was named the Most Valuable Player of the 2014 Ontario Hockey League Playoffs after registering 28 points (13-15-28) in 16 postseason games for Guelph, including three assists in the series clinching Game 5 victory over North Bay. A FEW FAVES: Fabbri’s favourite movie is Step Brothers, his favourite actor is Will Ferrell, his favourite music group is Florida Georgia Line and his favourite non-hockey athlete is Lionel Messi. HONOURABLE MENTIONS: Brian Elliott made 31 saves for the Blues, while Paul Stastny and Troy Brouwer each had a goal and two assists.